Don't Mind if I Do: Chocolate cake with a name I can't pronounce. This decadent, rich, melt-in-your-mouth chocolate cake is called Gateau au Chocolat Fondant de Nathalie...yeah, it's French. And it tastes as fancy as it sounds. My friend (that lives in France, of course) from Coconuts&Cardamom posted this recipe a little while ago and I was determined to try it for a special occasion. What better occasion than the chocolate-lover's holiday, Valentine's Day? This recipe did not disappoint. 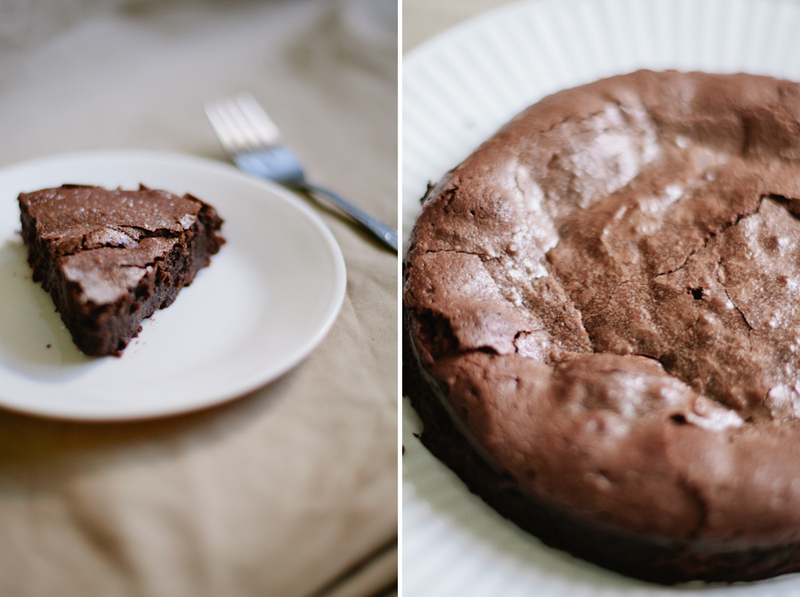 It really is one of the best chocolate cakes I have ever had/made. 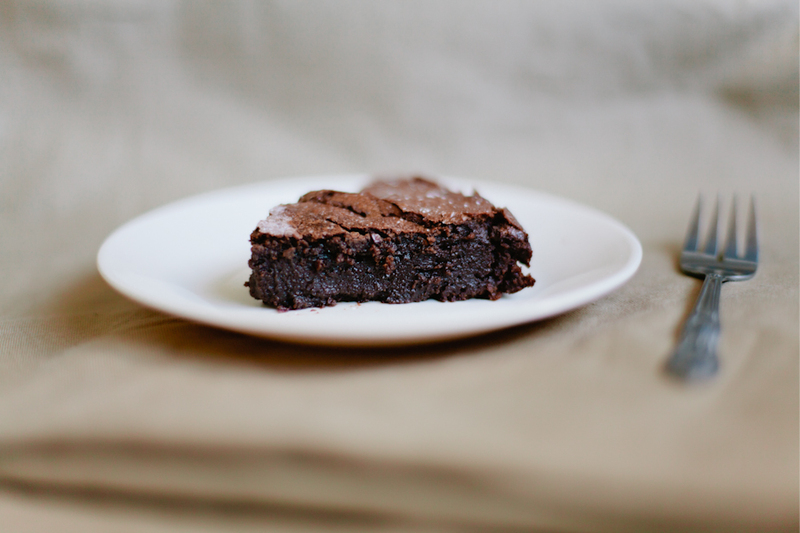 It is like a dark, gooey brownie meets a rich, moist chocolate cake. The one thing that was surprising was how easy and fast it was to make. You have to give it a try! Preheat the oven to 375 degrees Fahrenheit, butter an 8-inch round cake pan. Line the base of the pan with parchment, and butter again. Chop the chocolate and melt gently with the butter in a double boiler. I used a glass bowl placed over a pan of simmering water on the stove. Once melted and smooth, add the sugar to the chocolate-butter mixture and stir until combined. Set aside to cool for a few moments. Add the eggs one by one, stirring well after each egg, and then add the flour. The batter should be smooth. Pour batter into the buttered cake pan and bake for approximately 25 minutes, or until the center of the cake looks set and the top is shiny and a bit crackled. A tooth pick entered will not come out completely clean, but batter should not be too wet. 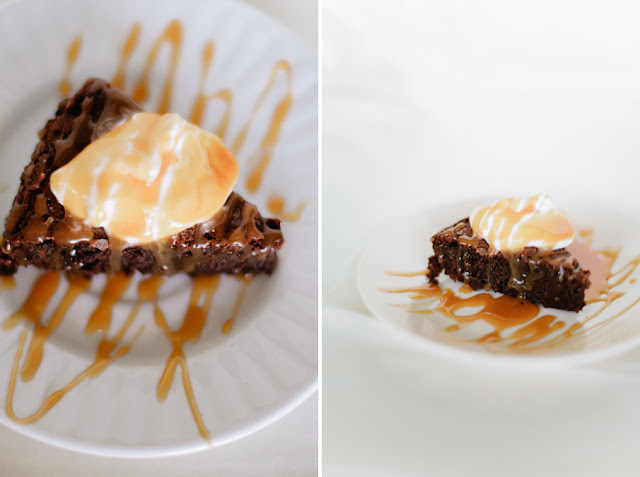 Serve in wedges slightly warm or at room temperature, sprinkled with powdered sugar or served with a dollop of fresh whipped cream drizzled with caramel sauce (shown below).